When we heard that the Merrywell were doing diner style American breakfasts we were quick to head over and check it out. We love that there are so many great restaurants around Crown, but the parking is always such a pain and so inconvenient, not to mention expensive that we don’t often go there. Our parking frustrations in this case left us just a bit irritable about the whole thing but we were still excited when we arrived and were looking forward to a good meal. 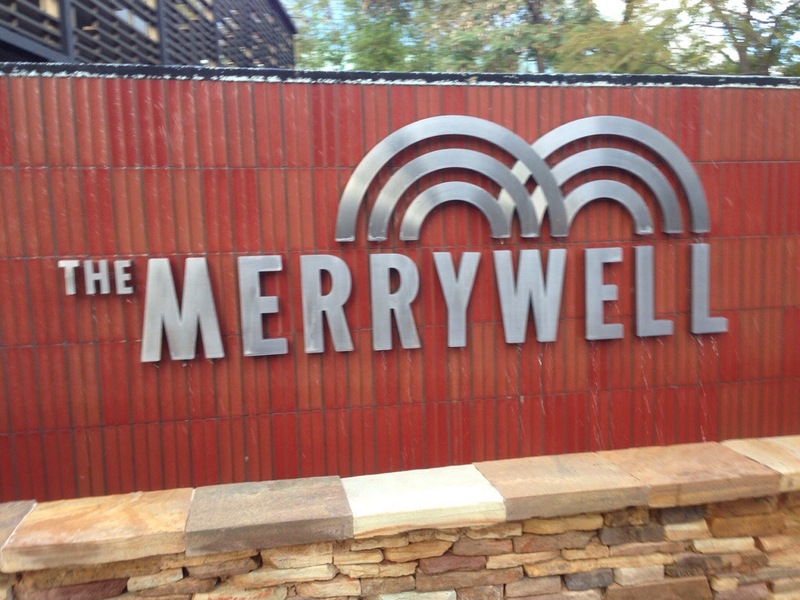 The Merrywell is wildly popular for their delicious dude food cuisine, but their breakfasts are a recent development and the restaurant was eerily empty to anyone who has been there in the crowds on a Friday night. The other people there with us seemed to be a mix of foodies like us who were checking out the new breakfast, some bright eyed travellers and bleary eyed people coming off a night out at the Crown. The new menu is authentic to its diner vision, serving up traditional drip coffee and refilling for free throughout your meal. It was a nice change from the usual espresso coffee, and the free refills were a bonus. This was not the style of coffee we tend to drink, but the strong, bitter black coffee you would expect from a diner. 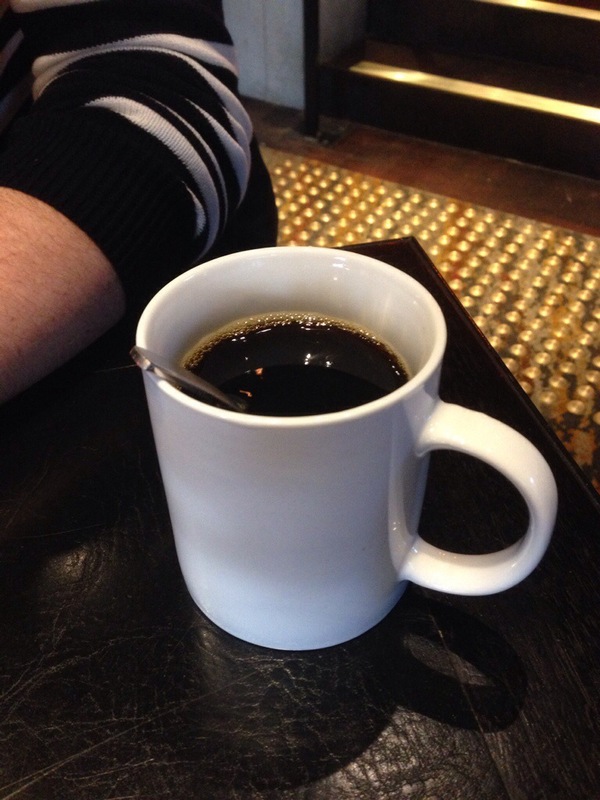 We’ll stick to our specialty filter coffees when we drink black but it was a good experience in authenticity. 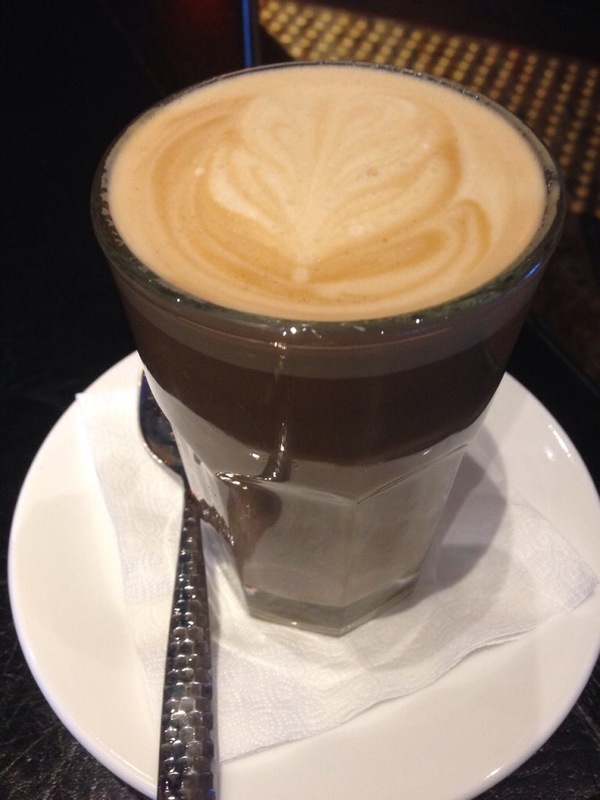 We also tried a latte. This was just bitter and over extracted, not a good brew, we probably wouldn’t try their espresso coffee again. 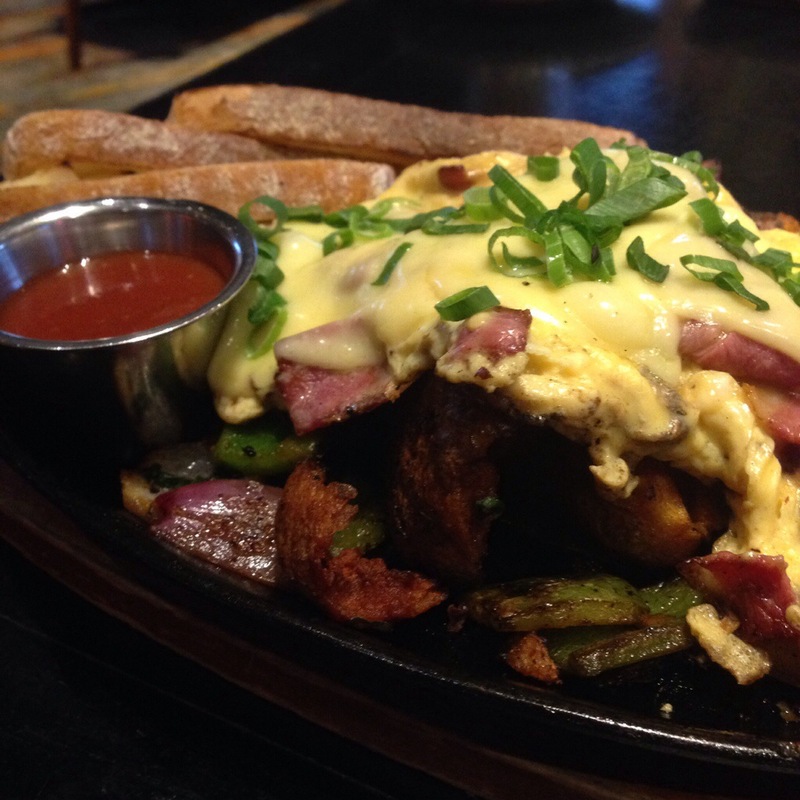 The first dish we tried was the skillet, we found it to be a lot like an Americanized big breakfast. When you had a mouthful of everything on the plate all in one go it really packed a punch. It’s all at once cheesy, creamy, spicy, smoky and meaty. The potato chunks were to die for, so crispy and delicious, while the tomato relish added a bit of punch and moisture. This dish was really designed to be eaten together and with the exception of the potato, most of the elements just didn’t hold up well when eaten alone. Its a nice change from the run of mill big breakfast, but could have and some more complex flavours. 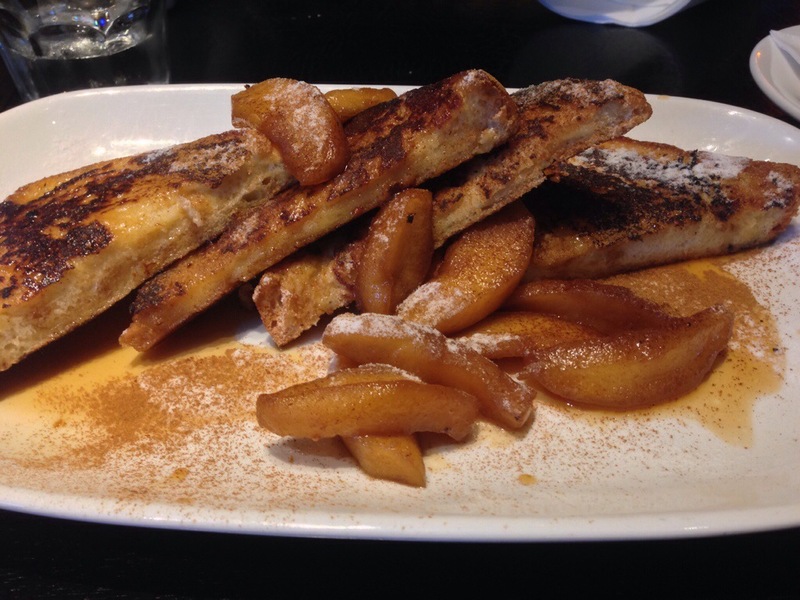 Our sweet dish was an apple and cinnamon french toast, and our waiter brought it to us with a massive smile on his face, happy to tell us it was his favourite dish. We were not disappointed! The flavours were wonderful, apple and cinnamon is tried and tested goodness. The french toast itself had a nice lightness and was well cooked though a touch soggy in some spots. The dish was quite heavy and intense overall, especially with the stewed apple, this could have been remedied easily with a creamy element, even a simple double cream would have done it. Even a whipped cream, served from the can in front of you as we’ve seen in so many sitcoms would be an easy and theatric add on. 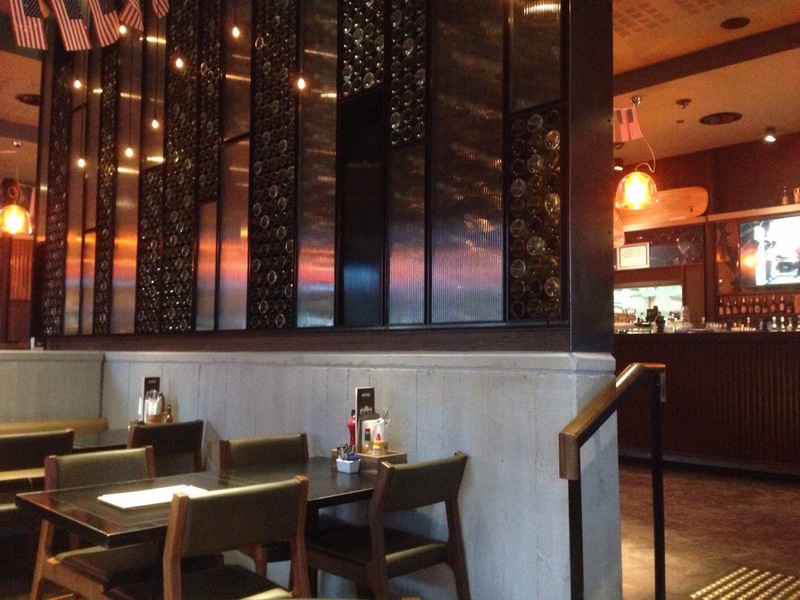 We loved the idea of diner style US cuisine for breakfast and it was a great fit for the Merrywell but it probably needed a little more refinement in the execution. Its location is also an inconvenience factor for us, but others may not find this as frustrating as we did. 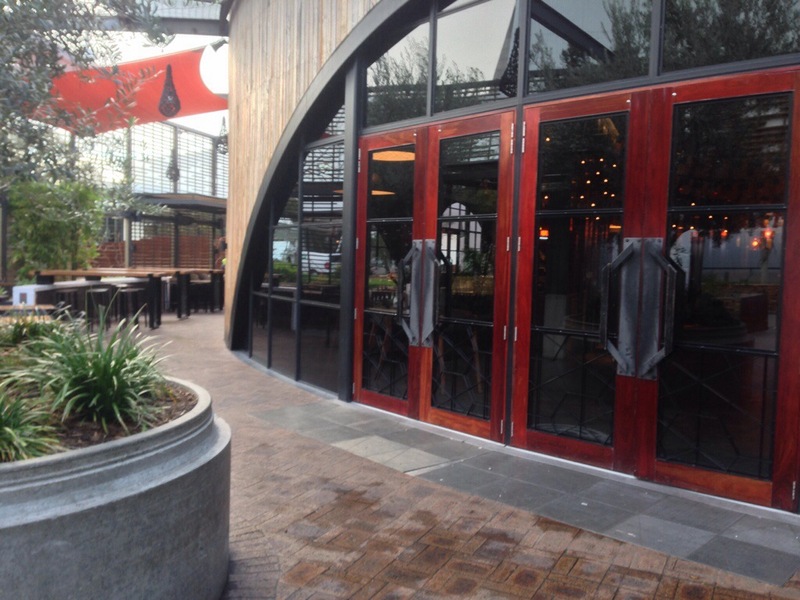 For fans of the Merrywell and dude food in general their breakfast will be a must visit! Previous PostJus Burgers, Jus Awesome!